Mentor Overhead Door Corporation’s rolling service door product line ensures that your project specifications will be met with ease and style. We carry rolling steel doors, rolling counter doors and rolling sheet doors. We install and repair industrial dock doors. Ideal for situations where sideroom and headroom are at a premium. Our upward coiling service doors fit openings up to 1500 sq. ft. (139,355 sq.mm) and are available with the industry’s widest array of slat profiles, curtain materials and colors. We offer a virtually endless array of options to satisfy both aesthetic considerations and working requirements. We handle sales, insulation, and repair of all rolling steel doors. We are the Mentor source for commercial and industrial overhead doors. Fabricated of interlocking steel, stainless steel or aluminum curtains in a variety of slat profiles, finishes, and options, our doors are designed for durability, serviceability and good looks. Each of our rolling service doors is computer designed to your specifications, then solidly constructed to promote easy installation, trouble-free operation and long life. 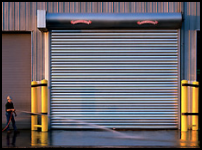 From the lightweight, economical 26-gauge Coil-Away® door to the 14-gauge C-600 slat 610 Series door, our comprehensive system of rolling service doors covers the spectrum of commercial/industrial applications. Overhead Door Corporation’s rolling counter doors provide a multitude of attractive solutions for smaller openings to 18×4″ wide and 8×4″ high (5588mm and 2540mm). Ideal for a host of applications in commercial, retail, corporate and professional environments, our comprehensive system of counter doors encompasses three basic types — metal curtain, wood curtain and integral frame and sill. When your project requires an attractive and solidly constructed rolling sheet door that is also easy on your budget. Overhead Door Corporation’s rolling sheet doors are a perfect solution. These door systems incorporate innovative design elements that enable fast installation and ensure smooth operation for enhanced door life.